Na bykans 'n dekade van grondwetlike regsontwikkeling, word howe steeds versoek om geskille tussen skoolbeheerliggame en hul onderskeie provinsiale onderwysdepartemente by te lê. Alhoewel verskeie redes hiervoor uitgelig kan word, fokus hierdie artikel op aangeleenthede wat betref die Staat en skoolbeheerliggame se besorgdheid aangaande die voorsiening van gehalte-onderwys in die taal van keuse ingevolge artikel 29(2) van die Grondwet. Die doeltreffendheid van regsmiddele in hierdie verband, word aan die hand van drie prominente hofsake, naamlik Laerskool Middelburg, Laerskool Mikro en Hoërskool Ermelo ondersoek. Vir die doeleindes hiervan, is 'n dokumentêre navorsingsontwerp en hermeneutiese benadering binne 'n kwalitatiewe dimensie in die kleine gevolg om die ervaring van minstens twee persone wat verbonde is aan elk van die skole en betrokke was by elke hofsaak, te bekom. Die resultate van die studie dui daarop dat taal oor die algemeen 'n polities-gedrewe aangeleentheid is, dat regsmiddele inderdaad - met verloop van tyd - verligting en sekerheid bring en dat howe wél die korrekte forum is vir geskilbeslegting wat betref onderwysaangeleenthede. Congratulations! The court has just ruled in your favour. The easy part was winning the case. Now for the tricky part - getting the other party to pay up. After more than a decade of constitutional jurisprudence, courts are constantly requested to intervene between schools' governing bodies (SGBs) and their respective provincial departments of education (PDoEs) in order to remedy issues of conflict between them. Although various reasons for such education litigation can be outlined, this article contemplates only those issues pertaining to the State's and SGBs' concern regarding the provision of quality education to all learners in the language of choice in accordance with section 29(2) of the Constitution of the Republic of South Africa, 1996 (the Constitution). The medium of instruction is selected since litigation in this regard seems to be fruitless. Malan,1 Malherbe2 and the Federasie van Afrikaanse Kultuurvereniginge (Federation of Afrikaans Cultural Associations),3 for example, show that courts' verdicts only bring relief in the short run. They do not stop PDoEs to continuously pressurise schools to change their language policies. Despite their theoretical value, legal remedies have, thus, proved to be inadequate in practice.4 This led to, as pointed out by Malan,5 the realisation that the previously devoted confidence of SGBs in the capability of the law and courts to guard their position, in determining their own language policies, is unjustified. In view hereof, this article attempts to answer the following question: Are legal remedies provided by courts effective in remedying the battle between SGBs and PDoEs over, specifically, the language policies of schools? In providing an answer, a brief background is provided, the right to education in the language of choice is analysed, the legal status of SGBs and PDoEs in South Africa is discussed, and the legal remedies available to them, are addressed. To illustrate this, three prominent court cases namely Middelburg,6 Mikro7 and Ermelo8 concerning the right of SGBs to establish the language policy of schools in terms of section 6(2) of the South African Schools Act9 (the Schools Act), in which courts were requested to remedy the situation, is scrutinised throughout. In order to establish the effectiveness of the three court verdicts, we added a small qualitative research dimension to obtain the perspectives of the three SGBs involved, regarding the relief obtained. The article ends with significant recommendations. Lastly, we underpin the article by following an hermeneutical approach.13 Such an approach refers to reading written text or content for the sake of an interpretive appreciation while considering context and original purpose meticulously. The concept text is broadened to incorporate, among others, in-depth interviews.14 Therefore, we added a small qualitative dimension to our investigation in order to obtain the current perspectives of the three SGBs involved,15 regarding the relief obtained. The small qualitative dimension comprised of conducting telephone interviews with at least two people who were involved in each school's court case, whether part of the SGB or of the legal advice.16 The rationale for choosing telephone interviews lies in the fact that the authors of this article were interested in using a cost-effective way of gaining a fresh perspective on each of the selected cases by reporting on the outcomes of the remedies and court orders.17 The interviewer guarded against causing the schools any harm or anguish by (1) explaining to each participant what the research entailed; (2) inviting each participant to take part; and (3) acknowledging each participant's consent or refusal.18 The possible disadvantage of open-ended questions that form part of telephone interviews19 was negated by the fact that the participants were all familiar with the relevant court case. The language of instruction in multilingual countries remains a problem. In South Africa, specifically, Malherbe20 opines that the constitutional protection of languages seems not to be worth much as government is neglecting its duty to uplift the status21 of the nine official indigenous languages in particular, while mother-tongue education remains only to be ideal words. The right to education is globally recognised as a fundamental, socioeconomic human right22 as it provides a means to human empowerment, political participation, quality of life and equal access to public services. Fleisch and Woolman,29 concurrently, offer the opinion that singlemedium public schools may exclude learners from schools if they have access to another school offering adequate instruction in their chosen language. Where this right is, however, denied, Barry30 points out that the State via its responsible education authority, carries the onus of providing a reasonable and objective justification for its denial. This is essential as (a) the Norms and Standards in Public Schools31 place significant constraints on the ability of single-medium schools to turn down learners, who prefer and will benefit from, instruction in another language32 and (b) no language should be forced upon learners nor should they unreasonably be deprived of the opportunity to use their language(s) of choice.33 These Norms and Standards make explicit what is meant by the phrase where reasonably practicable as a qualifier in terms of section 29(2) of the Constitution) as it determines that it is reasonably practicable to provide education in a particular language of learning and training if at least forty learners in a particular grade within Grades 1-6 or thirty-five learners in a particular grade within Grades 7-12 request instruction in a specific language at a particular school. Bray34 highlights that section 29(2) endows learners with a right against the State; bestowed with the enormous responsibility of realising it in practice, per se. This is due to the fact that significant authority over public schools is vested in national and provincial spheres of government.35 As such, the State is primarily responsible for all public schools and thus obliged to afford the best feasible outcome by utilising the various educational alternatives36 accessible to them in a bona fide manner. Seeing that the State can be held accountable by the community for the outcomes37 of its actions, Malherbe38 urges government to reconsider what may be judged to be educationally feasible while, as outlined by Cheadle et al,39 paying attention to the important factors of reasonableness, equal education opportunities and the necessity of redressing past imbalances. PDoEs, must also, as outlined by Bray,40 explore ways of sharing scarce resources and providing alternative language maintenance programmes at schools and/or in school districts which cannot be provided with and/or offer additional languages of instruction. The important role of all citizens in protecting and giving effect to individual rights was highlighted by the Constitutional Court in S v Manamela45 by showing that it does not only depend on State action, but also on the conduct of all fellow citizens. Honoré,46 similarly, argues that everyone is incited to treat others as responsible agents as it promotes individual and social well-being by preserving social order, encouraging good behaviour and creating a sense of personal character and identity that is valuable for its own sake. Visser47 demonstrates that there are at least four key role-players involved in exercising direct control over education, namely PDoEs, principals and educators, as well as SGBs. SGBs were, accordingly, created within the parameter of the principles regarding the decentralisation of power, to govern schools in partnership with the State.48 As such, the Schools Act aims at upholding the rights of all learners, parents/caregivers and educators and promoting their acceptance of responsibility for the organisation, governance and funding of schools as equal educational partners. The creation of SGBs is regarded by Woolman and Fleisch49 as a lineation of a fourth level of democratic government as a unique political institution. Bray,50 to the contrary, opines that SGBs do not form part of the spheres of government or state organs working within the sphere of public education. Because of this disagreement, the position of the State and SGBs needs further clarification. SGBs were created by the Schools Act, stipulating their functions while also providing a useful framework in terms of which school education must function and be managed in obtaining the objectives of the Constitution.51 As juristic persons, schools via their SGBs are, moreover, obliged to exercise their statutory functions52 in the best interests53 of their schools and learners. SGBs are, inter alia, considered to be sites of representative (a first step towards self-governance, according to Woolman and Fleisch),54 participatory and direct democracy. As such, SGBs possess the authority to take community-based decisions55 on, for example, the developing of school language policies. As a result, SGBs can be seen as popular means for political participation as they in many respects reflect the most important interactions that citizens may have with the State and possess the potential to be the foundation of social cohesion56 among South Africa's diverse population. In granting parents/caregivers and learners who live together and know schools and their surrounding environment best, the opportunity to make decisions regarding the education of the youth, participatory democracy is enhanced. Woolman and Fleisch,57 accordingly, regard the Schools Act to represent the ideal for the creation and maintenance of social capital. They base their finding on the fact that such decisions have the potential of creating trust, loyalty, friendship, kinship and commitment to shared objectives. However, since SGBs were created by the Schools Act, they are not constitutionally mandated establishments. As a result, their functions can be altered and even eliminated66 by the State through the promulgation of legislation.67 This must, conversely, be done with great care as the court indicated in the Mikro case68 that the State must be able to justify its actions in each case. In the absence of the latter, courts will regard its actions as arbitrary and in violation of constitutional and statutory provisions.69 In protecting the community from arbitrary state actions, Grote,70 however, emphasises the practical importance of independent courts being able to apply the ideal of rule of law,71 thus controlling administrative matters by way of judicial review.72 Altering the functions of SGBs through legislation is considered by Bray73 as a way to counteract the self-governance of public schools,74 thus not only infringing upon their legal personality, but also opposing the constitutional ideal of transforming education and allowing for democratic participation in this sphere. In view of this, it is essential to take note of the Constitution providing for principles of cooperative government and intergovernmental relations. Public schools, along with PDoEs82 act as institutions/functionaries performing a public function83 as they are responsible for providing public education in an impartial, fair, equitable, transparent, competitive and cost-effective manner84 in terms of legislation. As organs of State,85 PDoEs and public schools via their SGBs must adhere to the basic democratic values and principles governing the public administration86 as they are, as emphasised in the Ermelo case87 always required to act within the confines of the law. They are, moreover, bound to the constitutional principles of cooperative governance and intergovernmental relations,88 which have, as referred to by Barry,89 considerable consequences for the conduct of public schools and for their relations with one another. Practice, in stark contrast, unfortunately does not mirror effective cooperation. This could be ascribed to the close link between SGBs and the State leading to the distinction between their functions being blurred, resulting in extensive tension at school level. Various authors attribute this to the State not respecting SGBs,91 thus illegally intruding in SGB-functions92 while disrespecting the law, as well as the rights of SGBs and learners93 to legislation providing little scope for decisions by SGBs,94 and to attempts aimed at merely pursuing parents/caregivers to accept financial responsibility for education. It is in view of these discrepancies that SGBs and PDoEs are obliged to consider carefully whether existing legal remedies can effectively combat existing conflict between them. The ubi ius ibi remedium-principle in South African law entails a legal remedy existing for every right.95 This involves that the existence of a legal right implies the existence of an authority (judiciary, acting as the natural guardian of individual rights96and as administrators of justice)97 with the power to grant a remedy whenever a right is infringed.98 As such, legal remedies99 protect rights by providing legal subjects the opportunity to enforce their rights. Since establishing an appropriate and effective remedy for the breach of a right remains a challenge,102 South African courts have been allocated wide remedial powers to grant remedies in, especially, socioeconomic rights cases to which the right to education belongs. Courts may, inter alia, grant appropriate relief,103 including a declaration of rights104 and may make any order that they deem just and equitable.105 They may even develop new, effective and innovative remedies if needed when constitutional rights are infringed.106 To be effective, Chenwi107 proposes that remedies must be capable of promoting social transformation and of enhancing participatory democracy, transparency and accountability. To obtain this, the Constitutional Court108 shows that courts need to consider the interests of all who may be affected by their orders (a wider public facet) and not only that of the parties to the litigation. It is, however, important to take cognisance of the fact that disputes between organs of state are subject to the constitutional principles of cooperative governance. As a result, state organs are obliged to settle intergovernmental disputes between them by means of procedures provided for that purpose, and to exhaust all other remedies (thus avoiding legal proceedings)111 before approaching a court to resolve such a dispute.112 In debating the applicability hereof on disputes between PDoEs and SGBs regarding the determination of language policies for public schools, the Supreme Court of Appeal in the case of Mikro, found such a dispute not to be of an intergovernmental nature and, consequently, not limited. The reason held for this finding was that SGBs are not subject to the executive control of national or provincial education authorities. In support, Barry113 contends that public schools cannot be barred from instigating legal proceedings against a PDoE under circumstances involving unlawful State conduct, while SGBs conform to statutory requirements. It was, accordingly, found in the matter of Laerskool Gaffie Maree118 that the PDoE, as an administrator, can be required by courts to comply with its expressed or implied duties. By subjecting State action with regard to education to judicial control, Grote119 shows that it, inter alia, contributes to a higher acceptance of legitimacy concerning their actions by state organs, as well as to a broader acceptance of their decisions by the public. The principle of legality and the suitable exercise of administrative powers by a PDoE was also a concern in the matter of Hoërskool Ermelo. The court, accordingly, condemned the illegal actions of the PDoE by suspending the principal, withdrawing the functions of the SGB and determining the school's language policy against the wishes of the SGB. It was, equally held in the matter of Laerskool Middelburg that the PDoE acted unlawfully in changing the school's language policy, contrary to the best interests of the learners involved. By applying section 33 of the Constitution and specifically section 6(2)(d) of the Promotion of Administrative Justice Act,120 the High Court in Mikro121 found that an error of law indeed existed as the pDoE was not entitled to oblige the SGB unilaterally to accept a new language policy for their school. Since courts are reluctant to enter the sphere of the executive authority when administrators act in good faith,122 the court did not make an order regarding costs. In support of this, Currie and De Waal123 stress the fact that constitutional remedies should be progressive, in the best interests of the community and aimed at building capacity, which an award for damages is not. Awards are, hence, only made against officials whose actions were grossly irregular or blameworthy. (1) The first question reflected on the court orders/remedies and had five sub-questions. (2) The second question reflected on looking back on the case and had nine sub-questions. (3) The third question reflected on the current situation and had nine sub-questions. (4) The final question reflected on whether the trouble and effort had been worth the school's while. During the eight telephone interviews, the interviewer asked the same questions to all the participants. Originally, although it was clearly a politically-driven matter, in 2002 the school was encouraged that the court rejected the PDoEs allegations and accepted their bona fides. However, one participant reported feeling much like an empty shell, since after the court had pronounced its verdict, the matter simply dragged on for too long - it took nine years before the finances were resolved (2002 to 2011). It appeared as if the PDoE did not take note of the court order in the least: they did not adhere to any of the delivery dates. In order to carry on the school's education in the best interests of also the new learners who needed schooling in English, the Afrikaans-speaking parents/caregivers who were paying school funds had to carry the cost of R2 million in order to appoint the necessary educators until the end of 2009: the SGB appointed one in 2003; two in 2004; three in 2005; four in 2006; five in 2007; and so on. In the middle of 2005, the PDoE promised back pay for seven educators. Yet, they only started remunerating the school in October 2009 when they paid R1million. They paid the balance of R985,000 in October 2011. Moreover, nothing came of the large numbers of isiZulu/Sesotho learners who would, according to the PDoE, need English tuition in the Middelburg area. Half of the original English learners who enrolled in Grade 1 completed their Grade 7 year at Middelburg Primary School. Even though the principal and staff members went to much trouble to make sure that all learners felt secure and at ease, true integrated learner engagement still takes place only on the soccer field when they train and play matches, since these primary school isiZulu/Sesotho and Afrikaans/English learners clearly prefer home language conversations. Middelburg Primary School is a parallel-medium school, with a tendency of more and more English home language parents/caregivers now sending their children to the school. Growing numbers of Afrikaans-speaking learners who enroll at this school have necessitated the building of a new classroom for their Grade Rs. Although the school feels the court order itself was effective, they are convinced that public schools should be weary of trusting their and PDoE and even the national Department of Education's promises. This SGB was fully prepared when the case went to court, although it did everything in its power not to take the legal route. Even the day before the case actually commenced, they requested and got a discussion with the Member of the Executive Council (MEC), hoping to come to some kind of workable agreement. However, during the discussion it was clear that the MEC preferred taking the matter to court. When the verdict came in favour of the school, it was evident that the court underlined the seriousness of the matter. Towards the end of the school year, after having inquired about the department's late delivery on the court order, the PDoE fulfilled their promises concerning the English learners who joined the Afrikaans as medium of instruction school. They appointed and paid one educator; delivered school tables/chairs towards the middle of the year; and sent a number of textbooks just before the end of the year. The SGB had to use Afrikaans-speaking parents/caregivers' paid school funds to ensure instruction in the best interests of also the new learners who required English instruction. This led to a cash flow problem which the SGB counteracted by planning functions to make money. In addition, perhaps with the exception of classroom space that was available, the school did everything possible to ensure that the new learners fitted in well. According to all the responses from the telephone interview that one of the authors held with Mikro Primary School participants, this was unmistakably a politically driven issue. Moreover, the noise made by the ANC supporters at the court unnerved the school representatives. Mikro Primary School is convinced that the court case was not a waste of time for the following reasons: (1) the school and its parents/caregivers must set an example to their learners and the learners would question the example if it appeared that the school and its community were not willing to stand up for what they said they believed in; (2) the school had gained recognition for being principled; and (3) schools can make a difference as long as the principle is uncompromised and the process followed is 100% correct. One of the participants in the telephone interviews held the opinion that the court order provided guidance as to how SGB's should proceed. A legal opinion of a participant was that the court did not justify sufficiently what it meant with the phrase that the SGB needed to show a greater responsibility towards the community. Likewise, the court did not define the concept community. In this regard, the school community lost, since, according to the Schools Act,127 an SGB firstly stands in a trusting relationship towards the school - not the community. Secondly, the SGB needs to act in the best interests of the school - not the community. Therefore: what was the point of politicising a case for the sake of a handful of learners when the bigger dilemma lay with 1300 other places unavailable to learners who needed to enrol at high school level in that area? The school gave effect to the court order within the specified six weeks of the court order, by (1) holding a meeting with the community as they saw it; (2) holding a meeting with the parent/caregiver community; and (3) adjusting the language policy - maintaining Afrikaans as medium of instruction, while accommodating English learners in order to support their PDoE. The PDoE made the affidavit at the court concerning how they plan to handle the increasing demand for education in English as medium of instruction. The SGB not only made some of their own teaching posts available to appointing educators for the learners who needed teaching in English as medium of instruction, but also used Afrikaans-speaking parents/ caregivers' paid school funds to ensure instruction in the best interests of all the learners at their school. A few of the English learners who joined Ermelo High School in 2007 are finishing off Grade 12 at the end of 2011. The article does not concur with the opinion that the faith that SGBs had concerning the court's capability to guard their function to determine public schools' language policies has diminished. SGBs' faith in courts is rather supported by empowering and even broadening the execution of their functions by providing guidance and surety for future accomplishments. 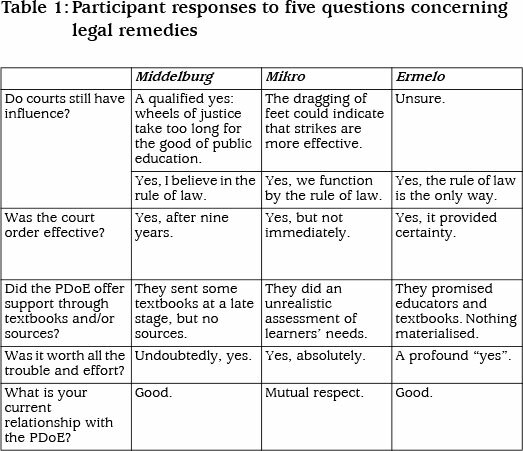 Although Mikro was sceptic at first about having the matter litigated in court, all eight participants reported their confidence that courts were eventually the proper forum to effectively remedy issues of conflict between them and their PDoEs. Reasons for the latter can be found in the fact that all the participants realised the court's affirmation of the seriousness of each school's battle. The schools' trust in the legal system and rule of law was furthermore confirmed by appreciating courts' inclination to litigate public school education matters objectively. All three court cases confirmed the autonomy of an SGB as a functionary by respecting their significant role in the governance of public schools. Thus, SGBs need not be afraid of litigation although, for court remedies to be effective in practice, careful preparation combined with perseverance (nine years in the case of Middelburg) is essential. Although the literature review indicated that court verdicts only bring relief in the short run, the qualitative research pointed out the opposite. While the three schools experienced immediate relief after the courts' orders, they soon realised that they needed the loyalty towards the school and determination of their Afrikaans-speaking parents/caregivers to carry them especially financially through the painstaking time. This had to be in place until the respective PDoE complied with the court sanctions. (1) SGBs must seriously consider parallel language as medium of instruction at their schools. (2) Section 16(2) - which refers to an SGB to stand in a position of trust towards the school - and section 20(1)(a) - which obliges a public school to promote the best interests of the school - must be revisited in order to extend the SGBs responsibilities towards also taking into account the needs of the broader community. (3) Courts must define terminology they read into statutes: for example, the term community and the phrase needs of the community in the Ermelo case, as these aspects were left dangling in the air. (4) Alternatively, courts must show extreme caution when interpreting education statutes while deciding on matters that fall within the function of SGBs, as this may contribute to again creating tension by blurring the distinction between their functions and that of the State. In sum, the legal remedies provided by courts are indeed effective in remedying the battle between SGBs and PDoEs concerning the language policies at public schools. 2 "Taalregte in Suid-Afrikaanse skole (tydelike verligting van onverpoosde druk)" 2006 TSAR 197. 3 "The Federation of Afrikaans Cultural Associations welcomes the Mikro Judgement" 2005 http://vryeafrikaan.co.za/lees.php?id=272 (accessed 2013-02-15). 4 The Constitutional Court in National Coalition for Gay and Lesbian Equality v Minister of Home Affairs 2000 2 SA 1 (CC) parr 65, 81-2 outlined that constitutional remedies are, especially with regard to socio-economic rights ineffective as they often amount to sheer declarations. 5 2010 T vir Geesteswetenskappe 262 260. 6 Laerskool Middelburg v Departementshoof, Mpumalanga Departement van Onderwys 2003 4 SA 160 (T). 7 Western Cape Minister of Education v Governing Body of Mikro Primary School 2005 10 BCLR 973 (HHA). 8 Hoërskool Ermelo v Head, Department of Education, Mpumalanga 2009 JOL 23349 (SCA). 10 Green & Browne Research design 38 in Principles of social research (2005) (eds Green and Browne). 11 Rapley Doing conversation, discourse and document analysis (2007) 111. 13 Babbie & Mouton The practice of social research (2001) 30-31. Merriam Qualitative research. A guide to design and implementation (2009) 32-33. Neuman Social research methods. Qualitative and quantitative approaches (2011) 101. The theory dates back to the 19th Century. 15 Middelburg, Mikro & Ermelo. 16 In the end, we interviewed eight persons. The interviews took 42-75 minutes each. One of the three schools was hesitant in the beginning; the other two grabbed the opportunity. 17 Rapley Doing conversation, discourse and document analysis (2007) 20. In general, written documentation of a school's perspective on the extent to which a court order, for example, was executed, is not readily available. 20 "Taal in skole veroorsaak nog 'n slag hoofbrekens: Regspraak" 2010 TSAR 610. 22 Bray "Macro issues of Mikro Primary School"2007 Potchefstroom Electronic LJ 2; Roach "Crafting remedies for violations of economic, social and cultural rights" in The road to a remedy: Current issues in the litigation of economic, social and cultural rights (2005) (ed Squires) 111-126. 23 Various other sections provide for language and language rights: ss 6, 30, 31, 35(3)(k), 185, 186 and235 Constitution. 24 "Legality and legal reform in the public sector" 2006 TSAR 360. 25 Reasonably practicable - the Constitution requires education authorities to provide education in the language of choice in public schools where this is reasonably practicable. Given the range of official languages (11 - s 6), the Constitution provides this internal limitation to the right. Whether or not it is reasonable practicable, a consideration of various factors is needed, such as language usage, practicality, expense, regional circumstances and balancing the needs and preferences of the population (s 6(3)(a)). 28 "Language rights in education: the international framework" 9-22 in Multilingualism, Education and Social Integration (2003) (eds Cuvelier, Du Plessis and Teck); Laerskool Middelburg 173B, 173F; Kriegler J in Ex parte Gauteng Provincial Legislature, moreover, suggested that the State will no longer support public institutions that privilege one way in the world over another. For those who insist on education in their language of choice, the Constitution, through s 29(3) provides the right to form independent schools out of their own resources. 29 "On the constitutionality of single-medium public schools" 2007 SAJHR 66. 30 Schools and the law: A participant's guide (2006) 48. 31 GN 1701 in GG 18546 of 1997 as promulgated by SASA and the National Education Act. 32 Fareed & Waghid "In defence of deliberative democracy: challenging less democratic school governing practices" 2005SA Jof Ed 27. 35 "Democracy, social capital and school governing bodies in South Africa" 2008 Ed and the Law 55; Barry 23. 37 Visser & Loubser 28. 39 South African Constitutional Law: The Bill of Rights (2002) 540. 44 This is particularly so when the implications these rights have for educational planning, the provision of sufficient resources and the availability of qualified educators are taken into account. 45 2000 3 SA 1 (CC) par 100. 46 Quoted by Visser & Loubser Thinking about law: Essays for Tony Honoré (2011) 26. 51 In Pharmaceutical Manufacturers Association of SA: In re: ex parte President of the Republic of South Africa 2000 2 SA 674 (CC) par 44 the court found: "There is only one system of law. It is shaped by the Constitution which is the supreme law, and all law ... derives its force from the Constitution and is subject to constitutional control". 52 Ss 20, 21 SASA. 55 Visser 360; Fareed & Waghid 25. 56 The cornerstone of economic stability - Chipkin & Ngqulunga "Friends and family: social cohesion in South Africa" 2008 J SA Studies 65. 58 Schools remain subject to overall control (management and governance) by the national education government in the sense that they must comply with national and provincial norms and standards (Bray 17). 59 Bray "Autonomy in school education in South Africa: a legal perspective" 256 in Autonomy in education (2000) (eds Berka et al). 60 Mikro supra parr 20, 22. 61 Ss 2, 8, 33, 39,195, 237. 66 S 22(1) SASA; Woolman & Fleisch 55. 67 Thus, changing the balance of power between SGBs and National Government. 68 Mikro parr 33, 34. 69 Woolman & Fleisch 66. 70 "Public law in transformation" 2004 SA Public Law 514. 71 The ideal of rule of law constitutes one of the core principles of contemporary constitutionalism. 72 The review of administrative actions is inherent in the jurisdiction of courts. Since it has also been constitutionalised by s 33 Constitution, the enforcement of administrative law in courts has largely become a constitutional matter (Hoexter Administrative law in South Africa (2008) 463). 74 Eg s 20 - changing SGBs' powers to recommend and appoint educators; Education Law Amendment Act causing confusion and alarm about the role of the SGB and the HOD in learner suspension and expulsion. 79 Laerskool Middelburg; Ermelo; s 9 Constitution. 81 Sachs "A Bill of Rights for South Africa: areas of agreement and disagreement" 1989 Columbia HR LR 27. 82 Provincial education departments (organs of State) form part of the executive authority of government, bestowed with the power to apply national policy on a provincial level (Hoexter 6). 83 S 239 Constitution comprehensively defines a state organ as "any institution exercising public power or performing a public function in terms of any legislation is an organ of state". 86 SGBs perform typical administrative actions in the management and governance of public schools. 87 Hoërskool Ermelo v Head, Department of Education, Mpumalanga 2009 JOL 23349 (SCA). 88 Ss 41, 195 Constitution. 92 Beckmann "The emergence of self-managing schools in South Africa: devolution of authority or disguised centralisation of power" J of Ed and the Law 154. 94 Woolman & Fleisch 47. 95 Kleyn & Viljoen Beginner's guide for law students (2007) 120; Labuschagne Trilingual student law lexicon (2004) 597. 96 Sachs 28; Grote 531. 98 Currie & De Waal The new constitutional and administrative law (2007) 196. 99 See Currie & De Waal 192: Legal remedies are about what can be done if an unjustifiable infringement of rights has transpired. 101 De Vos "Constitutional Court cleverly "solves" eviction dilemma - or not?" 2010 http://www.constitutionallyspeaking.co.za/constitutional-court-cleverly-solves-evictionsdilemma (accessed 2010-03-02). 102 Budlender "The role of the courts in achieving the transformative potential of socio-economic rights" 2007 ESR Review. 103 With regard to what appropriate relief entails, in the absence of a clear description in the Constitution, the Constitutional Court in Fose v Minister of Safety and Security 1997 3 SA 786 (CC) parr 98-99 concluded that it is left to the courts to decide in any particular case. This implies that the Constitution permits a flexible approach to remedies. 106 Fose v Minister of Safety and Security 1997 7 BCLR 851 (CC) par 69. 107"A new approach to remedies in socio-economic rights adjudication: Occupiers of 51 Olivia road and others v City of Johannesburg and others" 2009 Constitutional Court R 371. 108 Hoffmann v South African Airways 2001 1 SA 1 (CC). 109 In President of the RSA v Modderklip Boerdery (Pty) Ltd 2005 5 SA 3 (CC) par 21, this right was interpreted as the corollary of the first aspect of rule of law, which is the State's obligation to provide mechanisms allowing citizens to resolve their disputes. In Chief Lesapo v North West Agricultural Bank 2000 1 SA 409 (CC) par 22, it was viewed "as the right of access to a court as foundational to the stability of an orderly society as it ensures peaceful, regulated and institutionalised mechanisms to resolve disputes. As such, the right of access to court is a bulkwark against vigilantism and the chaos and anarchy which it causes". In Zondi v MEC for Traditional and Local Government Affairs 2005 3 SA 589 (CC) par 61, as an express constitutional recognition of the importance of resolving social conflict by means of impartial and independent institutions. It was also stated that the sharper the potential of a social conflict, the more important it is that disputes are resolved by courts. 110 Kollabatschenko v King NO2001 4 SA 336 (C); Baramoto v Minister of Home Affairs 1998 5 BCLR 562 (W). 111 National Gambling Board v Premier of KwaZulu-Natal 2002 2 BCLR 156 (CC); MECfor Health v Treatment Action Campaign 2002 10 BCLR 1028 (CC). 112 S 41(1)(h)(vi), (3), (4) Constitution. 116 Middelburg, Mikro & Ermelo. 117 Currie & De Waal 191. 118 Laerskool Gaffie Maree v MEC for Education, Training Arts and Culture, Northern Cape 2003 5 SA 367 (NC) par 13. 120 3 of 2000. Ss 6-9 PAJA focus on the scope of, the procedures for and the remedies in judicial review proceedings. 121 Governing Body, Mikro Primary School v Minister of Education, Western Cape 2005 3 SA 504 (C). This reasoning was upheld in the SCA. 122Hoexter 508, 466 - Judicial review is mainly designed for setting aside unlawful action. 124 Sanderson v Attorney-General, Eastern Cape 1998 2 SA 38 (CC) par 27. 125 Middelburg, Mikro & Ermelo. 126 Eight participants from the three schools took part in the interviews. No recordings were made; the transcripts of these telephone interviews are available from the second author of this article.